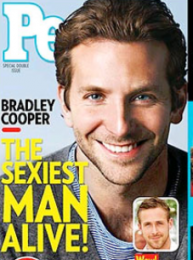 Bradley Cooper earned the People magazine’s Sexiest Man Alive 2011 on Wednesday. After hearing that he won the title, the “Hangover” actor said that his mother is going to be so happy. He also thought that it’s really cool that a guy who doesn’t look like a model can have this. Meanwhile, Bradley admitted that he is currently single but he didn’t see himself as a ladies’ man. Is Angelina Jolie Fed Up With Mainstream Film-Making?